About this Virtual Run: Someone is sexually assaulted every two minutes in the United States, and more than five children die every day as a result of child abuse and neglect. 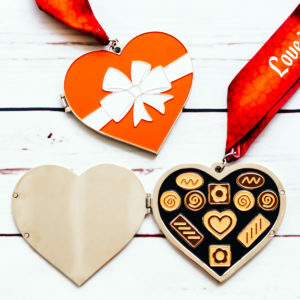 Help spread awareness and raise money for a charity whose vision is a world free of sexual assault, domestic violence, and child abuse by participating in the Heart of Gold virtual 5k/10k/Half Marathon. Run or walk whenever and wherever you want to earn what is without a doubt, the heaviest and most complex virtual race medal we have ever produced. HEART OF GOLD SWEEPSTAKES: When 10 lucky participants open their medals, they will find a GOLD heart-shaped charm and will win a Virtual Strides Prize Package that includes a Virtual Strides medal hanger, a Virtual Strides visor, and a $25 Gift Card! Winning medals will be randomly distributed throughout the race period, following our standard shipping schedule. For complete contest details, please read the Official Rules. Found a GOLD Heart inside your medal? Fill out the Heart of Gold Prize Claim Form by 11:59 p.m. EDT on March 31, 2017 in order to claim your prizes! About the Charity: The Joyful Heart Foundation was founded by Mariska Hargitay in 2004, with the intention of helping sexual assault survivors heal and reclaim a sense of joy in their lives. The vision of the Joyful Heart Foundation is a world free of sexual assault, domestic violence, and child abuse. The foundation’s mission is to transform society’s response to sexual assault, domestic violence, and child abuse, support survivors’ healing, and end this violence forever. The mission is carried out through healing, education and advocacy. The foundation has raised over $32 million to support its programs and has directly served more than 18,500 individuals. A portion of the proceeds from this virtual race (at least $5 from each registration) will be donated to the Joyful Heart Foundation. For more information about this charity or to make a direct contribution, please visit JoyfulHeartFoundation.org.